I wonder if it would work for mtb applications. But probalby not very well. The flex due to the whole unit hanging below the tube junctions, would probalby be enough to drop a chain on a SS MTB. It makes a lot of sense on a road tamdem though. Very nice looking design. 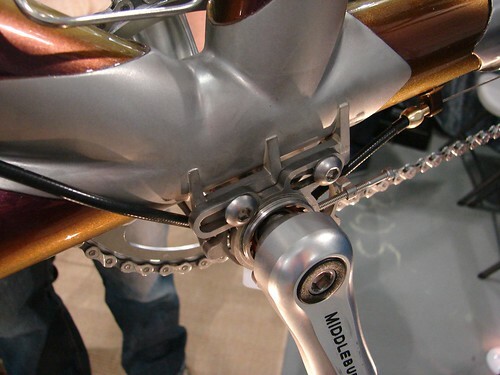 I suppose you could nestle the unit into the tubing junctions with some creativity, but the weight penalty would probably lose favor to the methods already in use (EBB, sliders, and fork ends). Of course, those are just my assumptions, and I may be totally wrong. 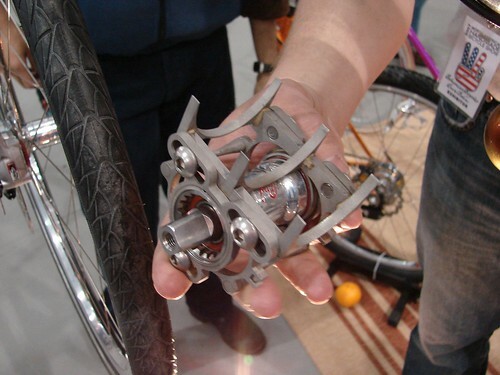 I also like the excentric rear hub mount that appeared at the same show (seen here...https://farm1.static.flickr.com/173/...9729bf7_b.jpg).